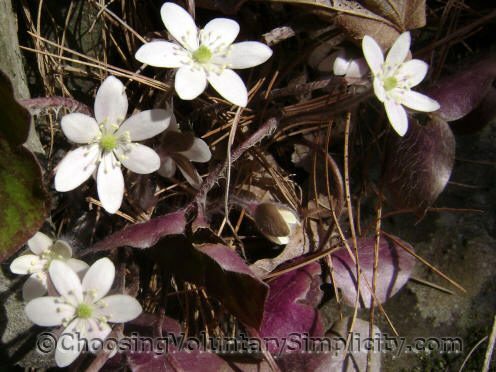 Hepatica americana is part of the buttercup family and the flowers can be any shades of lilac, bluish, pink, or white. Some of the flowers are scented, others aren’t, and supposedly no two groups of hepaticas will ever look exactly the same. 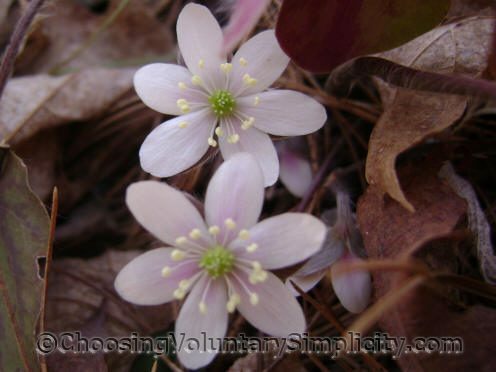 In early spring, hepaticas have leathery, ratty looking, brown leaves. These are the leaves from the previous summer’s growth… new leaves won’t appear until after the flowers have finished blooming. 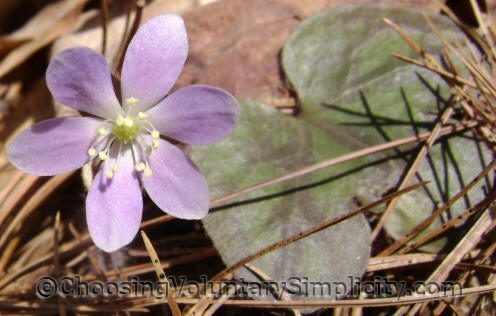 Hepatica leaves start out green and become a mottled greenish-purple. Some people think they resemble the shape and color of a liver, which is how hepaticas came to be called “liverwort”. Each leaf has three lobes and is very thick and coarse. 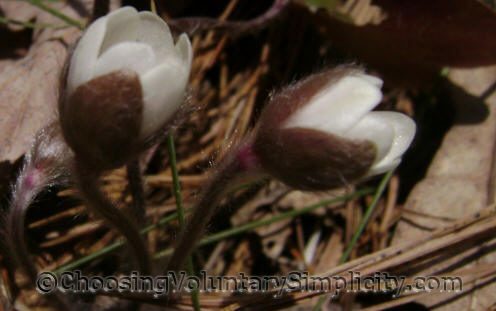 Both the leaves and flower stems are heavily covered with tiny hairs. Usually the plants grow in clusters, but it is not unusual to come across individual plants with only one or two flowers, growing alone. Hepaticas prefer the open woods and soil rich in leaf mold, and often they will thrive around the bases of trees. The showy part commonly thought of as the flower is actually six white or colored sepals with several pistils and stamens in the center of the “flower”. The pistils and stamens turn green after fertilization. Hepaticas are always our first sign of spring. This year, winter seemed to last even longer than usual… probably because we had the snowiest winter ever on record for this area, and because as recently as two weeks ago we still had over three feet of snow on our front lawn and almost everywhere else. Then we had a couple of days of a warm, steady rain, and a few more days of temperatures around 60°F, and much of the snow just disappeared. It was wonderful! The snow always takes longer to melt in the woods across the road from our house, and there was still quite a lot of snow over there, but I couldn’t resist checking to see if the hepaticas were blossoming yet… and they were. More hepaticas in bloom… suddenly it really IS spring! Is It Common Fleabane… Eastern Daisy Fleabane… or Robin’s Plantain Fleabane? This post brought back a lot of memories. We always had hepaticas growing on the border between our yard and the woods next to our house. I remember I always used to look forward to seeing them in the spring because to me that meant that winter was over. My sisters and I always used to keep watch to see which one of us would see them first. This blog is kind of like going home. I really appreciate all the hard work you must put into it but be aware that I really mean it when I say thank you. My mother has told me about hepaticas but I had never seen any. I showed her your photographs and she was thrilled because she has not seen any for many many years. She says that you captured the essence of this simple flower with your photographs, especially the way the lone flower appears amid the dead leaves and old foliage. Great job and many thanks from both of us. We used to have hepaticas growing in some woods near us but they are long gone now after 2 or 3 logging operations in the last 10 years. The hepaticas are gone, the mayflowers are gone, and the wild ginger is gone, also bluetts and so many other wildflowers. They’re just gone. I feel so bad about it because this is a part of this area that will probably never return. Agnes, I’m so sorry. We’ve had a somewhat similar experience in some of the wooded areas near here as the trees have been logged repeatedly over the years. Many of the wildflowers that used to grow so abundantly are either scarce or as you said just gone. Mayflowers are the ones I really miss. There was one spot in the woods where mayflowers grew but no other place around that I know of where they grow… and that spot of mayflowers is now under a four foot pile of “brush” that was left from the last logging operation. We don’t own the land so there was nothing we could do, but it is a real shame that so many of the wildflowers are dying out. Still looking for mine. The snow hangs on and on here, but we always have hepatica in bloom by the end of April… Love these little harbingers of spring!